2018-11-21 Grammy's Rocket Chair on a WHACK-A-DOODLE Wednesday before Thanksgiving! Is it Magic or Slight of Hand? Either way, there IS Deception going on....... Is it Lack of Information or Willful Ignorance? Either way, there IS Abuse of Power going on........ and Yes, Deception Too! There is NO Reason, in this Age of Information, for NOT Seeking Out "The Truth" of What's Really Going On and Who's Doing It ....... Laziness & Apathy are merely Excuses..... and ... See More Piss Poor Ones at that! If we Really Want the "Rights" stipulated in the Constitution WE are Going to HAVE TO Take Them Back & Start Exercising Them on a Daily Basis! If "They" want a "New World Order"..... Let's Give Them One....... One where the Order of the Day/Week/Month/Year/Decade/Century is SELF Governance! Take Back Control of "Your" Mind, Live "Your" Life based on Natural Law and There WILL Be Order in The World. There are Two Ways to BE A Light in the Darkness....... One is to BE The Candle...... The Other is to BE a Mirror...... and In Truth, You have the Ability to BE BOTH..... So SHINE ON! Thank You All for Giving a Listen & Be Sure to check out ALL the Other Awesome Shows here on the RLM! 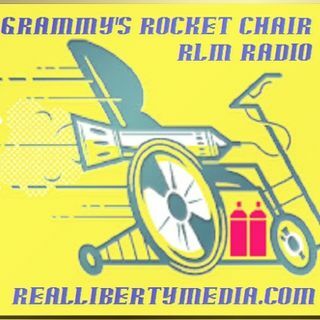 Grammy's Rocket Chair is LIVE Now!